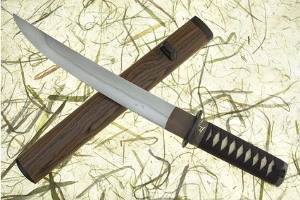 Description: This traditional tanto has excellent fit and finish. The fittings are from D.R. Langenbacker and Sons. 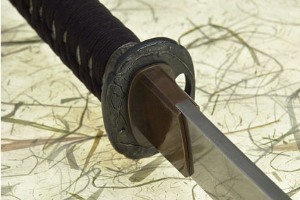 The blade is hand forged by Lonnie without the use of power hammer or hydraulic press. 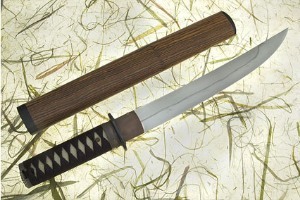 Lonnie clay tempers his blades to give the traditional hamon which strengthens the cutting edge of the blade while allowing the spine to retain its natural flex. The buffalo horn on the scabbard makes a striking accent to the bocote wood. 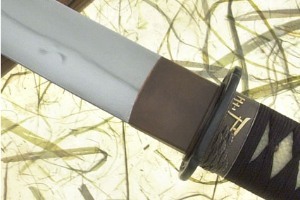 The tsuba is a traditional cherry tree pattern. The fuchi has a stylized pagoda and tree motif, whereas the kashira has a tree motif.